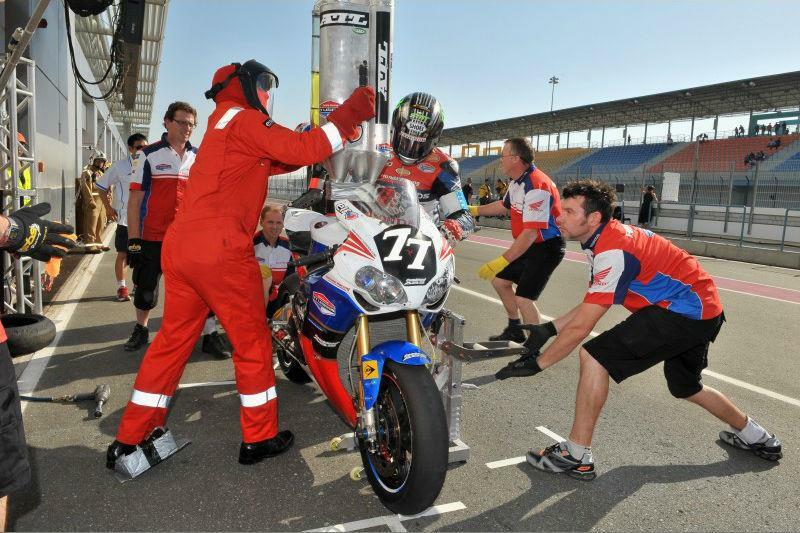 The Honda TT Legends inaugural Endurance World Championship came to a close today with a fifth place finish in the Eight Hours of Doha at the Losail International Circuit in Qatar. The resulting points take the team to seventh place in the overall standings. Stand-in rider Glen Richards started the race and put in a blistering first stint, going from ninth to second on the timesheets after the two leading teams collided and were forced to pit. A determined John McGuinness followed this up and ended his stint in third, before Keith Amor headed out for his first session on the Fireblade. Over the next couple of hours, the team switched places within the top six before settling into fifth as darkness fell. They then held this position until the end of the race with John McGuinness crossing the line to finish the eight-hour battle for the Honda TT Legends. McGuinness said: “We’ve finished three races this year with three fifths and I think that’s a fantastic achievement. Looking at the race results, you’ve got teams with massive experience and world championship titles above us so we’re the best of the rest if you like! Amor added: "It was quite an eventful end to the championship in the end. I’m really happy that the team has been able to move up to the seventh in the championship as we’ve had a few unlucky breaks this year. Glen and John did really, really well. It was tough to learn this track but overall it’s been a good year. I feel privileged to be part of the official Honda outfit." For Richards it was a whole new experience being part of the TT Legends team and he said: "I am really happy that I’ve been able to do a half decent job. It’s always the fear of the unknown when you haven’t ridden the bike before but it’s all worked very well. The team has been fantastic and the bike was really good. We managed to get fifth in the race and move up in the championship, which the team are very happy about so I’m happy." This is the team’s third fifth-place finish of the year – it completed both the Bol d’Or and the Le Mans 24-hour in the same position to secure seventh in its first ever EWC season. Team boss Neil Tuxworth said: "Our aim for this year was to finish sixth in the championship, but to be honest we are more than happy with seventh. It’s a great achievement in our development year and I think the whole team can be proud of what we have achieved. "We have learned an incredible amount over the season and we will take all that into 2012 with the aim of becoming competitive enough to fight for the podium."